Five key trends are shaping the enterprise content management (ECM) space. New business objectives, new market imperatives, and new cloud-based platforms compel technology and business decision makers to take a fresh look at their strategy and underlying platforms. 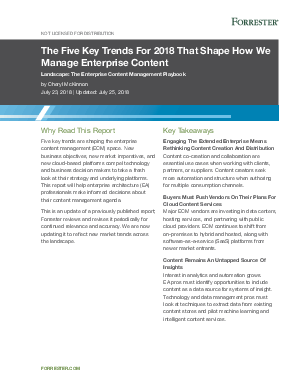 This Forrester report, sponsored by Systemware, will help enterprise architecture (EA) professionals make informed decisions about their content management agenda.